Corn season may run May through September, but holiday traditionalists will insist on its presence at the Thanksgiving supper table—so I’ve got two creamy, yummy satisfyin’ side dishes made of maize (corn’s earliest name). 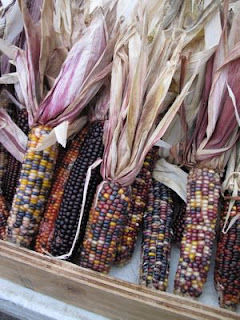 As most of us know, the pilgrims’ relationship with Native Americans grew from corn; thanks to a member of the tribe named “Chief Massosoit”, those just off the Mayflower—many of them our ancestors—learned to grow plentiful crops, surviving one of the harshest winters on record. The story has it that in less bounteous times, the Pilgrims had just five kernels of corn per day to eat, and as a reminder of those times, put five kernels on their Thanksgiving plates before the real feasting began. The legend says they gazed down upon those kernels with a kind thought for each one. The first kernel reminds us of the autumn beauty around us. The third kernel reminds us of God's love and care for us. When Nana helps get this year’s Thanksgiving feast on the table, she might use five candy corns (there must be a few left over from Halloween) and play a game that asks the kids to come up with no less than five things they are grateful for. In the old days, big social events revolved around shucking corn; they were called husking bees and featured live entertainment, great food and, of course, corn shucking contests. Since my Old-fashioned creamed corn recipe calls for 8 ears of fresh corn, I suggest dividing them up amongst the grandkids and seeing who can shuck their pile the fastest! To me, there’s nothing more comforting than a hot and creamy bowl of corn on a cold winter’s day…I like mine with an extra pat of butter melting on top, and dash of cracked pepper! My next side is a Toasted Corn Pudding. With its bell peppers, onion, bacon and heavy cream, it’s basically the very definition of savory; it’s also funny how beautiful and festive it looks in your best Corningware dish (Get it? Okay, I’m corny….)! Remember that this dish is best served straight out of the oven, so if you’re going to make it, let it be one of the last things you add to your Thanksgiving table before you sit down to eat. What If All You Want is a Simple Cornbread? Once you add the sugar n’ salt, and bake these ingredients (measured out to the proper amounts, of course) and bake as any traditional cornbread recipe directs, you’re good to go! I like this recipe from The New York Times dining section that reminds us old-fashioned cornbread is easy enough to make to become a suppertime staple! So there you have it, two more side dish ideas for Thanksgiving Day. No matter what’s served when you gather with friends and family, be grateful for it. TOP NANA is willing to wager there are more than five things you’re happy about!